To set up this shot, freeze the 1 bll to the rail at daimond no. 7. Tap this ball into the table lightly with the cueball. Freeze the two other balls in the direction of the dotted lines. Tap these balls in place also. 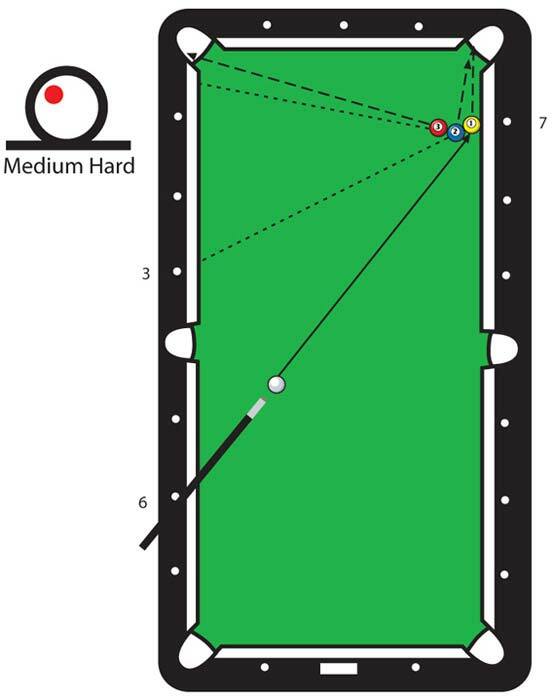 Position the cue ball to shoot directly over diamond no. 6. Call the three balls in rotation naming the pocket for each. Shoot the cue ball to pocket the 1 ball directly in the corner pocket using a little top let english and a solid stroke. Tapping the balls into a table lightly does not hurt the table or the cloth, however, there are many rooom owners who would prefer you do this on your own table.